the way to make progress as scholars and intellectuals; the weighing of evidence against interest. Great schools of Jewish archeology, given every motive to find to the contrary, and given every chance to find, in the Siani and the region, any evidence of the Exodus, were unable to do so. Came back empty handed and admited that there was no evidence for any Jewish life in Egypt or in the Sinai desert. 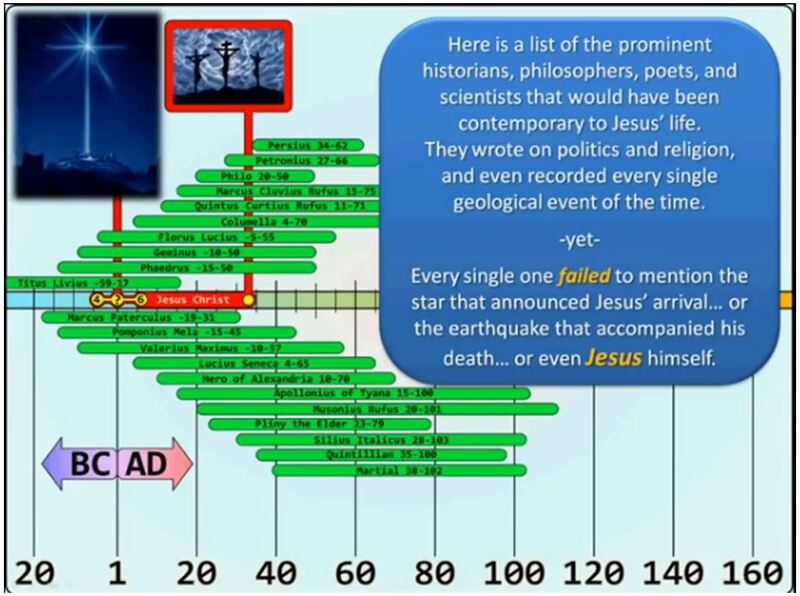 There were many prominent historiabns, philosophers, poets and scientists that would have been contemporary to Jesus’ life. Especially missing is any reference to the supernatural events that occurred when Jesus died. Note that there were 18 authors living during that time. “… and went into the holy city and appeared unto many”. Surly, if the above events can be reported 40 years after they happened, they would have been recorded at the time they happened … if they happened …. which they did not.